Words do not do Gracie justice. 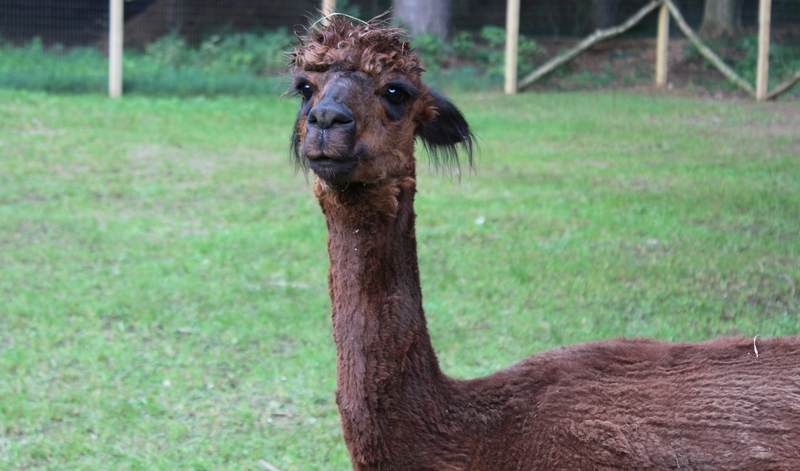 She is a phenomenal alpaca and is a proud part of our foundation herd. Gracie is a gorgeous dark brown girl out of 588 Peruvian Lancaster. She has produced nothing but show quality cria, just like her mama did. At ten years old, she still produces as much fiber as the young girls. She has a huge topknot, tons of fiber- reaching to the tips of her toes, great conformation and a correct bite. She is an easy keeper- behaves well for her shot, getting weighed, walking, and always has a perfect body score. She is playful when you get to know her and is a delight to have. Grace’s 2010 cria out of NM Beethoven took the first place ribbon in the juvi fawn competition. Her 2011 cria, Grace’s Contessa, won 6th place out of a competitive fawn juvi class of 12. This is believed to be her only show, but you should see her magnificent fiber. Grace’s sire is none other than 588 Peruvian Lancaster – need I say more? Lancaster is a 4x champion fawn male who is known for his outstanding cria. Gracie is a prime example of his work. Grace’s dam, Madison of Staghorn Valley, is a multi-ribbon winning medium fawn. She has thrown all ribbon winning cria. These wonderful parents give her fantastic genetics including: PPPeruvian El Moustachio, CPeruvian Tanya, and 6Peruvian Conan. Update: Gracie out did herself this time and produced not only an amazingly gorgeous cria but she made it a pattern. Gracie’s breeding to Crooked Creek’s Digby resulted in a fantastic medium brown and white patterned girl with black points. LMF Mademoiselle Antionette is everything anyone could possibly want in an alpaca and more. Annie is now part of our foundation herd.